Martin Luther King Jr 15 January 1929 4 April 1968 American Martin Luther King, Sr. Alberta Williams King Humanitarian, Writer, Civil rights activist, Minister, Pastor American Baptist minister, activist, humanitarian and leader of the African-American Civil Rights Movement. He is best known for his role in the advancement of civil rights using non-violent civil disobedience based on his Christian beliefs. 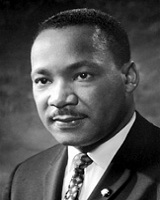 A list of popular martin luther king jr quotes are given below.